Fresh Truck operates retrofitted school buses as mobile markets to make affordable, healthy food accessible to low-income communities. Through FreshConnect, health care providers will be able to cover the cost of food for patients across Fresh Truck’s mobile market sites informing patient care. “It’s exciting to see what Fresh Truck has been able to accomplish in the Boston community and the possibilities of FreshConnect. We’re honored to be involved and have the opportunity to play the small role we are in its announcement,” said Johnny Fayad, co-founder of Eat Your Coffee. 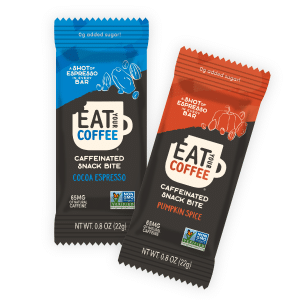 Eat Your Coffee is launching a new product of its own with its Caffeinated Snack Bites that are 100 calories or less, pack as much caffeine as a shot of espresso and have no added sugar. They’re hoping that these bites will not only energize its customers, but also, the start of the FreshConnect program with some additional fundraising. For every pack of Caffeinated Snack Bites sold on its website using code FRESHCONNECT, Eat Your Coffee will donate $5 to Fresh Truck from March 25 through Marathon April 19. For those of you counting, that is 26.2 days. 100 percent of Eat Your Coffee’s donation is going to a low-income Boston family to put a little extra healthy food on the table, so be sure to share this great campaign to help two local organizations in Boston. When checking out on Eat Your Coffee’s website, be sure to use the code FRESHCONNECT, to get Fresh Truck some funds and also score free shipping. Founded by coffee-deprived college students at Northeastern University, Eat Your Coffee is pioneering a new category in caffeinated natural snacks. The company’s first product line, Eat Your Coffee Bars, are date-based snack bars caffeinated with Fair Trade coffee (comparable to one cup) and made with real ingredients so you can feel good with every energizing bite. Eat Your Coffee snack bars are non-GMO, vegan, gluten free, kosher, 70 percent organic and available in three delicious flavors: Fudgy Mocha Latte, Salted Caramel Macchiato and Peanut Butter Mocha. Now that’s energizing. Fresh Truck is on a mission to radically impact health by getting fresh food to those who need it most. Their goal is to improve health outcomes and lower health care costs for communities that endure the highest rates of diet-related disease. Fresh Truck operates converted school buses as mobile markets to make affordable, healthy food accessible to low-income communities. Their new FreshConnect program is a ‘food prescription’ system that enables healthcare providers to cover the cost of healthy food for low-income patients across Fresh Truck’s mobile market sites.